OWOWOD is One Wire / One Way Output for Debugging library. 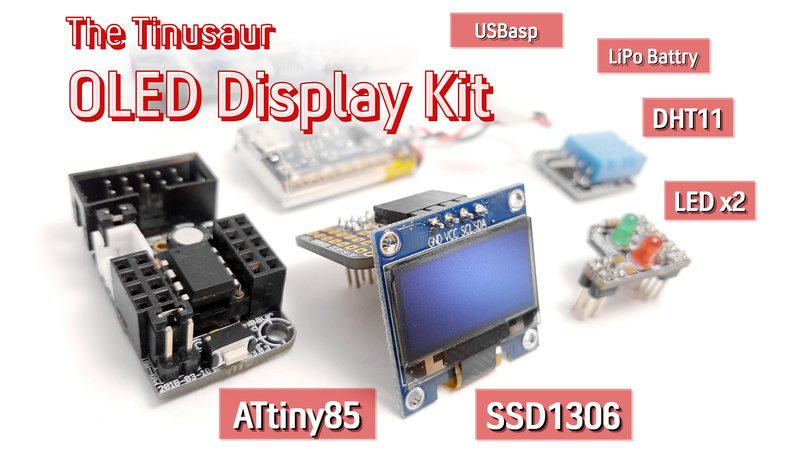 It allows you to output text from the Tinusaur (ATtiny85 microcontroller or other similar), though USB-to-Serial or TTL converter (based on PL2303, CH340G or similar) and to the computer screen using COM port monitoring tool. Why one would need something like that? … and see the output on a computer. Great for debugging and other things. Unfortunately there is no easy way of doing that – in fact not possible with the standard tools used to work with the ATtiny85. The problem is this: (1) those micro-controllers have too few I/O ports; and (2) most of the programmers (ex. : USBasp) do not offer that kind of communication between the micro-controller and the computer, i.e. there is no 2-way communication. There are some solution and the OWOWOD library is just one of them. It uses an additional hardware component – USB-to-Serial converter also known as USB TTL Converter. 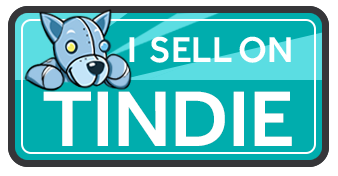 They are very inexpensive, easy to find and work with. The OWOWOD Library could do that. When you use a library function like owowod_print_char(‘U’) it will start sending sending the bits of the ‘U’ byte (hex: 0x55, bin: 01010101) in series, i.e. one bit after another, through one of the microcontroller pins – for instance PB3. At the other end of the wire there is USB-to-Serial converter that will take the individual 01010101 bits and re-compose them back into one byte as 0x55. Then the USB-to-Serial converter will send that ‘U’ byte (0x55) to the computer USB port. The computer sees the USB-to-Serial as a Serial COM Port port, so it reads that ‘U’ byte. Using another program on the computer we get that ‘U’ byte and show it on the screen. It works similarly for whole strings and other data. Always initialize with owowod_init() function. You can print char, string but also decimal signed and unsigned integer numbers. The decimal numbers are 16-bit integers. Because this would be used for debugging in most of the cases there are some helpful definitions for that purpose in the “debugging.h” file. DEBUGGING_STRINGLN adds CRLF new line at the end. DEBUGGING_VAR and DEBUGGING_VARU print variable name and then the value. DEBUGGING_ERROR prints the error code then the message. To see the results we need a program that will run on a computer and show on the screen the information that comes through the serial port. There are many programs that could do that. One particularly simple to use is the Hercules Setup utility by HW group – it is just one EXE file that you run – that’s it. This library was developed with and tested on the following microcontrollers: ATtiny85, ATtiny45, ATtiny25 but should also work on other tinyAVR chips. The library was tested to work with following USB-to-Serial converters: PL2303, CH340G. Source code is available at https://bitbucket.org/tinusaur/owowod. On eBay: USB to Serial TTL converter – to transfer the debugging output from the ATtiny micro-controller to the computer. In my previous post “OWOWOD – One Wire / One Way Output for Debugging the Tinusaur (Part 1)” I wrote how to get a proper reference signal from a serial communication using USB-to-Serial TTL converter. The next steps are to generate the same signal but programmatically using the ATtiny85. 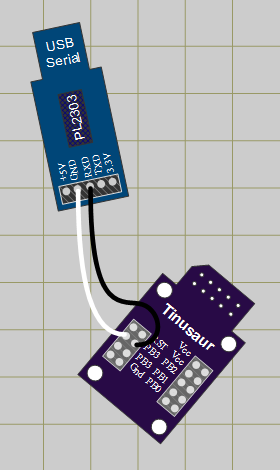 I used a ATtiny85 board, the Tinusaur – as you may have guessed already, connected with USBasp programmer to the computer. The PB0 is used as output but any other available port could be used. That could be done by changing the OWOWOD_PORT in the source code below. 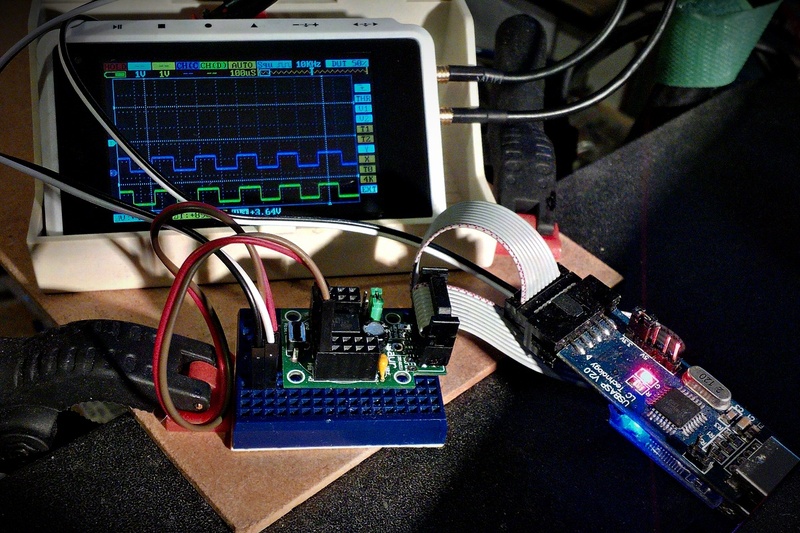 The output is connected to the second digital channel of my DSO Quad oscilloscope. The owowod_init() function sets the port as output and its level to high which is the default for the serial communication. The owowod_delay() function is a custom delay function that should produce a delay that is equivalent of 1 bit of serial data. This is just an empty loop that I experimentally determined how long it should be. The owowod_print_char(uint8_t) function outputs one byte of data in serial – starting from the least significant bit of that byte. To run the test I first started the COMStressTest program and let it output the “U” character (ASCII code in HEX 0x55) indefinitely. IMPORTANT: All the tests were done with the default settings for the serial COM port which are 9600 bps, 8 bits of data, no parity check and 1 stop bit. This is sometimes denoted as 9600 / 8-N-1 configuration. Then I ran the C program on the ATtiny. To get the two signals the same took of course some time to figure out what the timings (the delay between bits) should be. I am now another step farther. The next step will be to write a simple debugging library for printing strings and numbers. … have that running on the micro-controller and see the debugging output on my computer. Unfortunately that is not easy – in fact not possible with the standard tools used to work with the ATtiny85. The problem is this: (1) those micro-controllers have too few I/O ports; and (2) most of the programmers (the one I’m using is USBasp) do not offer that kind of communication between the micro-controller and the computer, i.e. there is no 2-way communication. Since the purpose of The Tinusaur Project is learning I decided to write my own. USBasp programmer – to load the program to the board. 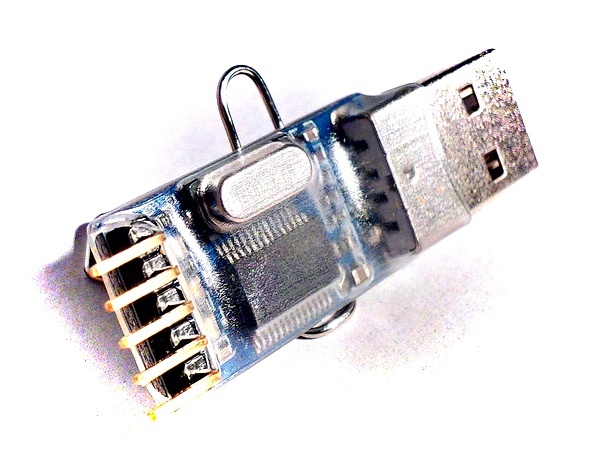 USB to Serial TTL converter – to transfer the debugging output from the ATtiny micro-controller to the computer. The USB-to-Serial TTL is a device that when connected to the USB port of the computer will look to the operating system like a Serial COM Port. Writing data to that COM port will result in transferring that data through the converter and out to the output pin called TxD – in serial form. It work similarly when receiving data from an external source of signal connected to the RxD pin. I connected the PB0 of the ATtiny85 to the RxD of the USB-to-Serial TTL and did some experiments. Soon I realized that the timing of the signals was critical for this to work and I needed better way to compose the serial data. First thing – a serial data character generator that I can use as reference – and what could be better than an original USB-to-Serial converter. I also needed a software that will generate sequence of test characters that I would use as a test signal. 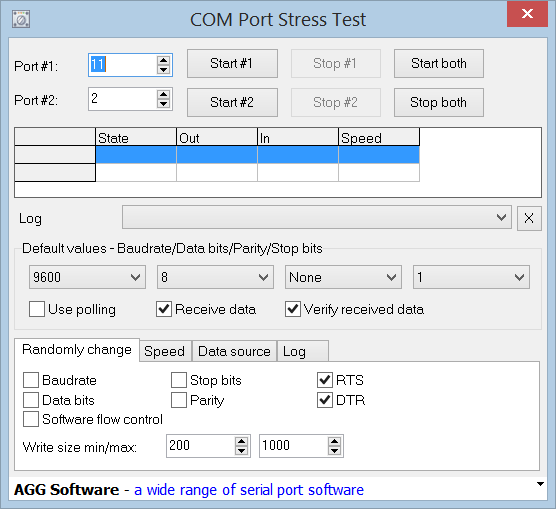 First I though of writing a simple Java program that will send the data to the COM port but then I found an application on Internet that does that already – COMStressTest from AGG Software at http://www.aggsoft.com/com-port-stress-test.htm. I specified my testing data in the “Data source” tab as an external file. The best testing sequence in this case would be string of “U” characters. This is because the generated signal will consist of equal LOW and HI intervals known also as square wave signal. 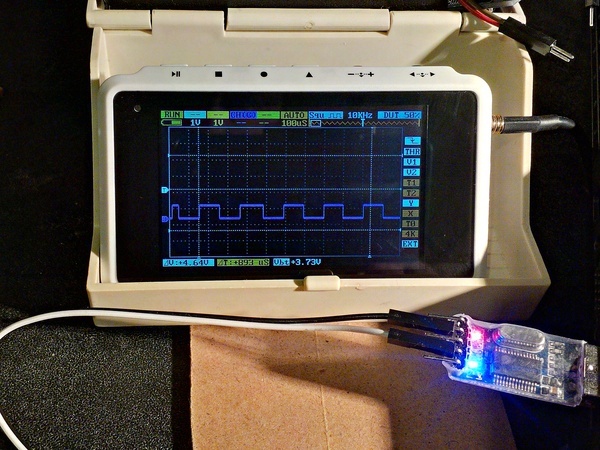 To look more precisely at the signal form and parameters I used an oscilloscope – mine is DSO Quad from Seeedstudio at http://www.seeedstudio.com/depot/DSO-Quad-4-Channel-Digital-Storage-Oscilloscope-p-736.html. The next step will be to write some code for the ATtiny that will generate the same sequence – all “U” character and try to make it exactly the same as the reference one.